Calgary and surrounding communities are experiencing flooding that exceeds the flood of 2005. The TransCanada Highway is closed between Canmore and Banff and Canmore’s Cougar’s Creek has become a raging river. High River south of Calgary is completely under water. Other surrounding areas are also affected with devastating floods. In Calgary, many of the communities around my neighbourhood have been put under mandatory evacuation. So far my community is still fine. The largest homeless shelter in Canada is being evacuated as I write. A thousand Drop In residents are walking over the bridge to the Bridgeland community. I had never experienced a natural disaster until that day. I had also never experienced the coming together of people to help others on such a massive scale either. It was humanity at its best. It was beautiful. “I don’t think many people understand just how devastated High River still is from the flood.” ~ Rob L.
Downtown High River felt like a Ghost Town when we pulled in on Sunday afternoon. Granted it’s not unusual for stores and restaurants to be closed in the smaller surrounding towns outside of Calgary on Sundays. There are quite a few empty storefronts along the main street with ‘For Lease’ signs on their windows. And many establishments like Carlson’s Live Music venue are still doing renovations. Don Carlson was outside on his bar’s patio working on something, when my friend Helga and I walked by and asked if there were any places open where we might grab a bite to eat. He mentioned a few places and in response to my “Ghost Town” comment, began to explain how difficult it’s been for local business to get-up-and-running again since the flood. “Some empty storefronts are even offering a year’s free rent on the condition a multi-year lease is signed,” he told us. The flood that ravished southern Alberta hit in June 2013. Here in Calgary, although there is still some evidence of damage caused by the flood, most repairs have been made. High River has built berms and implemented other preventative measures, and business owners who can afford renovations are doing so, but many are still struggling. Don invited us into his place. Renovations are coming along nicely and he showed off his new white Oak floor. And allows space for dancing, I enthused! When I asked which genre of music he typically books, he told me there’s quite a bit of Jazz at his place – and I do love Jazz! As we were leaving, Don invited us to ‘friend’ him on Facebook, thanked us for visiting and hoped that we’d return when Carlson’s is up and running again and other downtown businesses have recovered. If you live in the area, why not connect with Don on Facebook here as well, to stay updated on their status – and you too can pay them a visit when they’re up and running again. As for me? I’m pretty sure I’ll visit High River again to support Carlson’s and other local businesses. I would like to say a special thank you to Don Carlson for his hospitality and taking the time to invite a couple of Calgarians into his place to share the goings-on of High River. Do you believe in supporting local business? What is your favourite local business where you live? 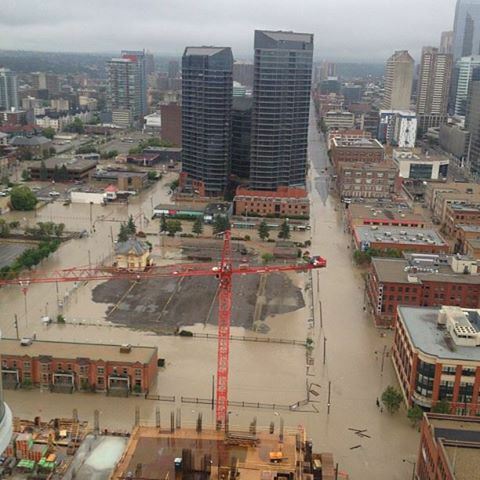 In June 2013, Calgary was devastated by the worst flood in a hundred years. You can read my personal account of events here, here and here if you wish. A lot of work has gone into repairs since. I was thrilled, on Wednesday, to discover that a new bridge was built, to replace the one that had been destroyed during the flood, linking Elbow Park to the Rideau community. This bridge opens up my favourite long walk to Rideau and beyond to Sandy Beach. I feel so connected again! The same is also true of metaphorical bridges, isn’t it? Life’s disasters come along and due to our own, or the actions of others, bridges are destroyed. The good news is that we can choose to make amends. We can choose to repair the damage. We can choose to build new bridges. JUNE 21ST MARKED THE ONE-YEAR ANNIVERSARY OF THE SOUTHERN ALBERTA FLOOD. 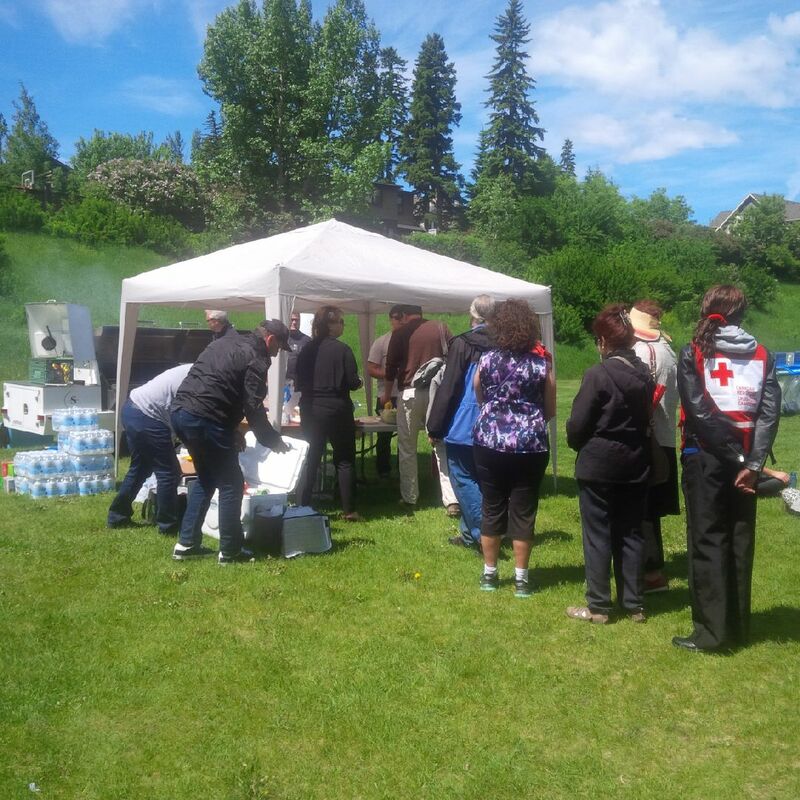 Last year 100,000 people were evacuated from their homes in Calgary and High River. It had been the worst flood since 1934. 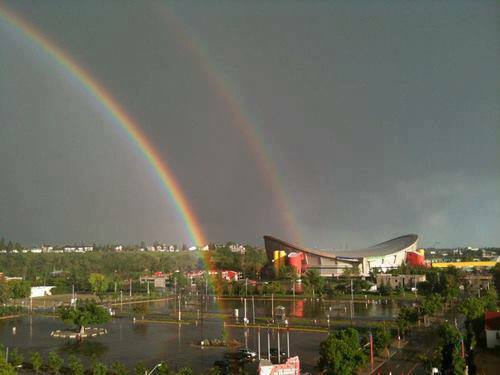 Calgary’s Saddledome was flooded to the 9th row of seats, as were the Stampede Grounds, the Calgary Zoo, the East Village, Bowness, Roxboro and Mission (just a few blocks east of my place), and several other neighbourhoods. My friend and I had walked around the Mission area last year and volunteered to help residents clean out their flooded basements. 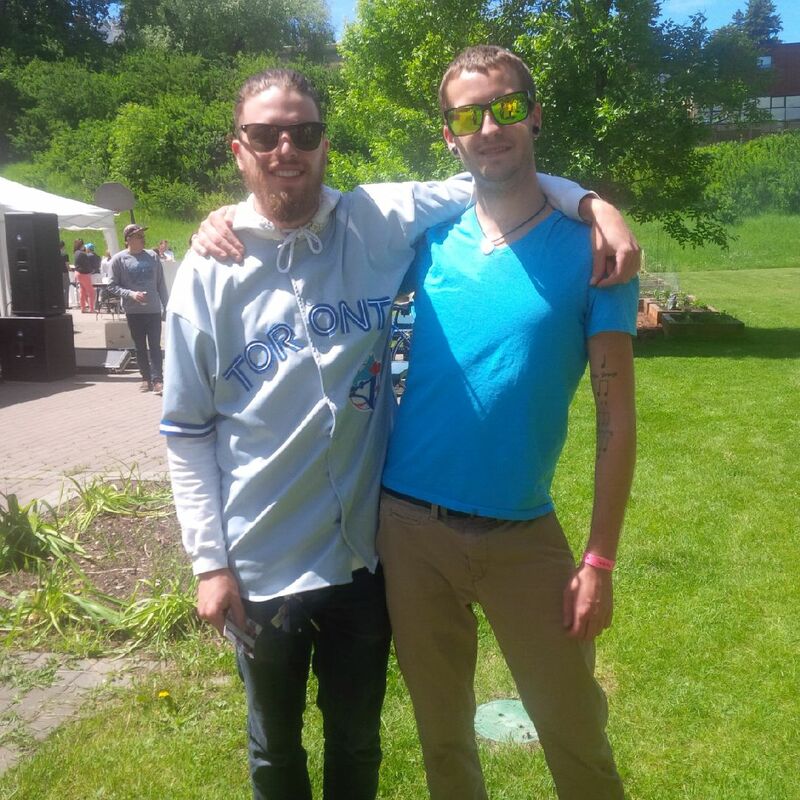 As the one-year anniversary since the flood approached many neighbourhoods were planning block parties to remember how the city and others came together to help victims of the flood. I decided to attend the Cliff Bungalow/Mission event. The Weatherman had promised a sunny day, so I was disappointed when I woke up to rain on Saturday morning. It seemed like an eerie reminder of last year – I felt uneasy. Luckily, the sun broke through the clouds by the time I headed to the Cliff Bungalow Park on Cliff Street and 22 Avenue SW. The two men above, each a member of one of two bands were scheduled to play after the formal part of the Mission Possible event. I met them as soon as I got there, as well as Mitch’s mom who declined to appear in the photo, in favour of having me photograph just her son and his friend. Free food was available to those who were affected by last year’s flood and the volunteers who helped flood victims clean up. Earlier in the morning I had been watching the news and a man whose property had sustained water damage hoped that the volunteers who had helped him would come to the event. At the time of the flood, he hadn’t learned their names, but he knew he would remember their faces – he wanted to say thank you. The Red Cross was also represented at the event and they were giving away free Preparedness Kits to the first 200 people to visit their tent. 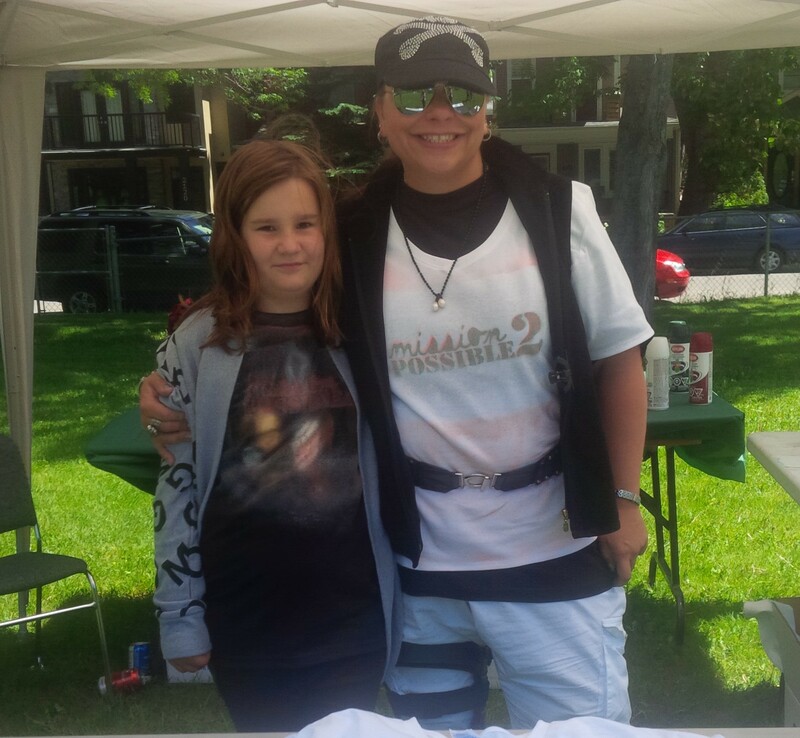 Volunteers were selling Mission Possible 2 T-shirts for $10. All of the money raised is going to the Community Association’s Resiliency fund to help the community. MP Joan Crawford presented special medals to three outstanding individuals who went the extra mile during the flood last year. Kent Hehr, MLA for Calgary Buffalo and long-time resident in the area talked about how he was born just three blocks away in 1969. Over the course of his life Hehr said he has seen Calgary grow in wonderful ways. 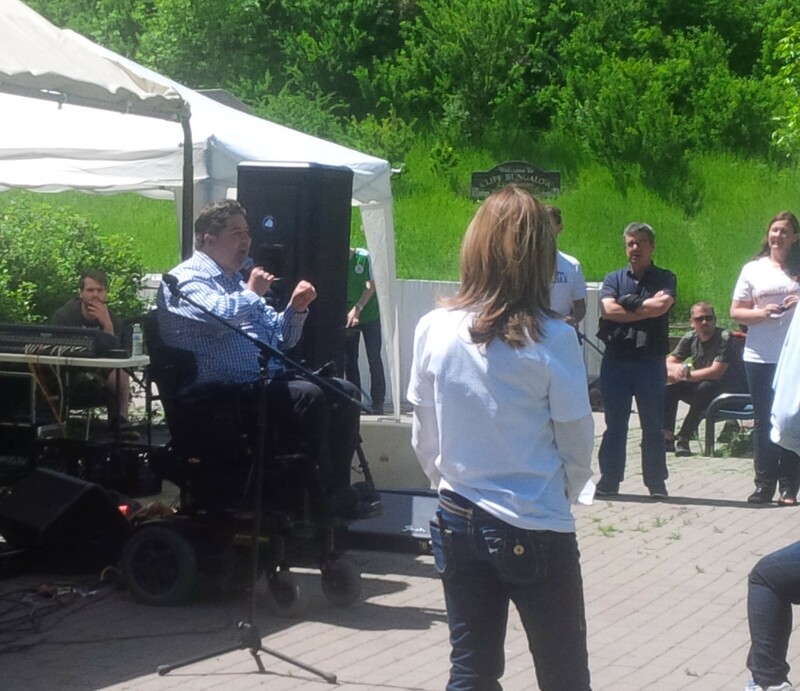 He stated how proud he was of Calgarians pulling together and overcoming a devastating situation. “I witnessed neighbours helping neighbours, friends helping friends and strangers helping strangers,” said Hehr. When I left the event, I decided to take the long way home and walked many of the same streets that were blocked off to traffic last year. In my mind’s eye, I again saw the soggy-wet gyproc in piles lining the streets, flooded vehicles, treasured family photos laid out to dry in the sun in the hopes that they might be salvaged and people everywhere covered in mud helping out. 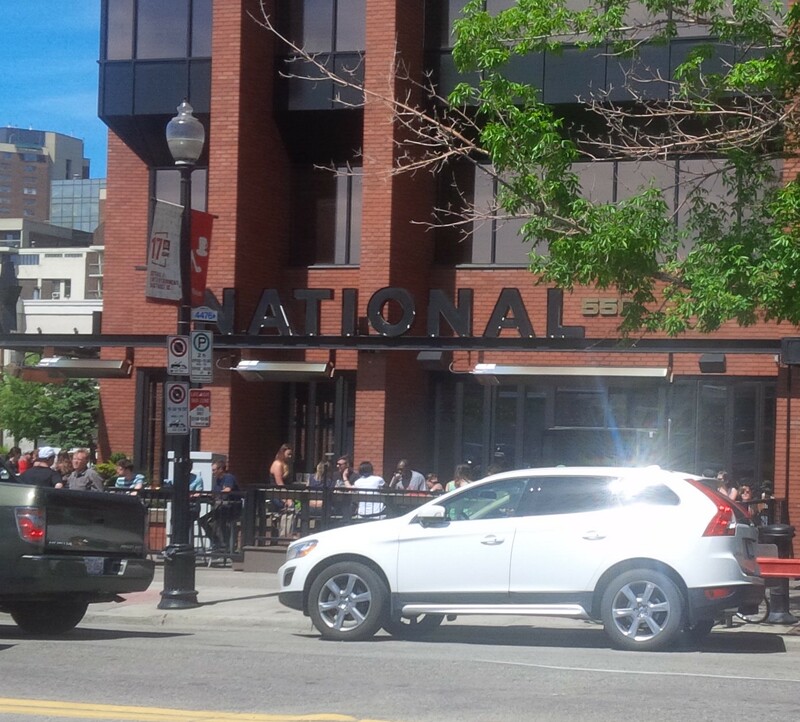 I got closer to home and walked by The Ship and Anchor and The National and saw their patios filled to the brim with people. I remembered how last year, in spite of having lost their power, they brought in barbecues and made burgers for victims and volunteers. When I think back on all the people who gave their time and money to help flood victims, I am still grateful and so very proud to be a Calgarian. 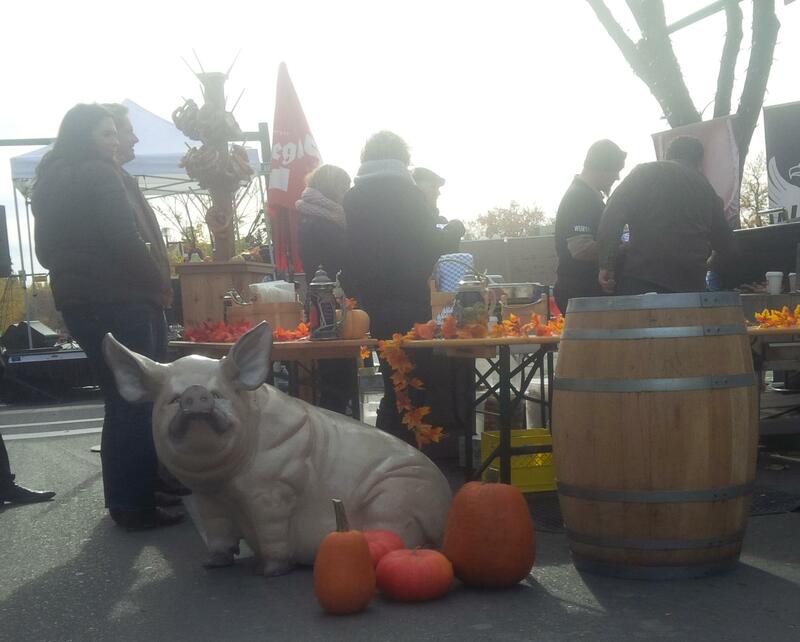 In an effort to bring business back to the Mission Area of Calgary, the 4th Street BRZ organized The 4th Street Block Party on Saturday October 19, 2013. 4th Street was closed to traffic from Elbow Drive to just about 12 Ave SW. Although some businesses have been open for several months since the flood in June, they are not seeing the usual foot traffic in the area. 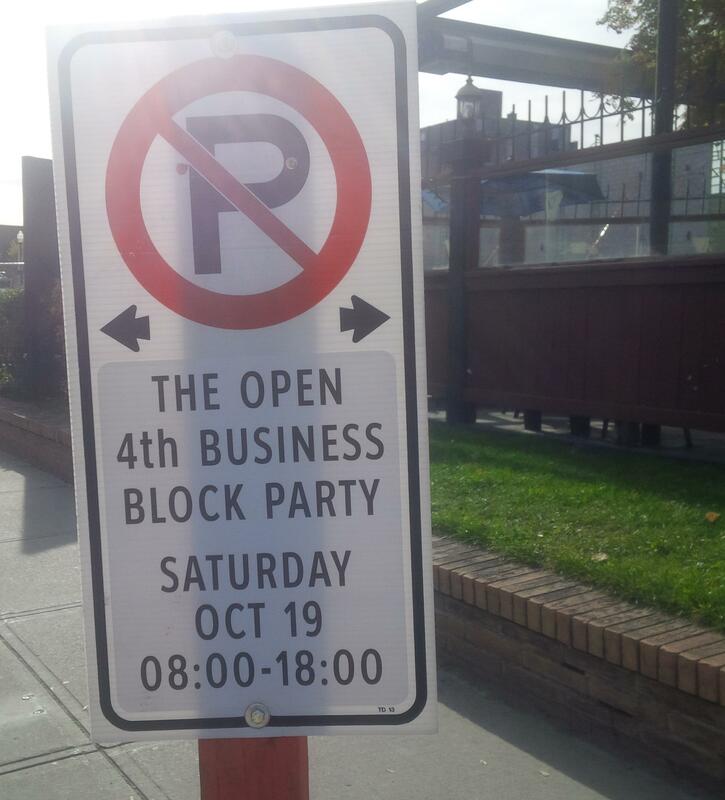 The 4th Street block party was organized as part of the yyc is open campaign to invite people back into the area. I had hoped more people would have attended but it was a fun event and several restaurants that aren’t even re-opened yet were providing food to those who attended. 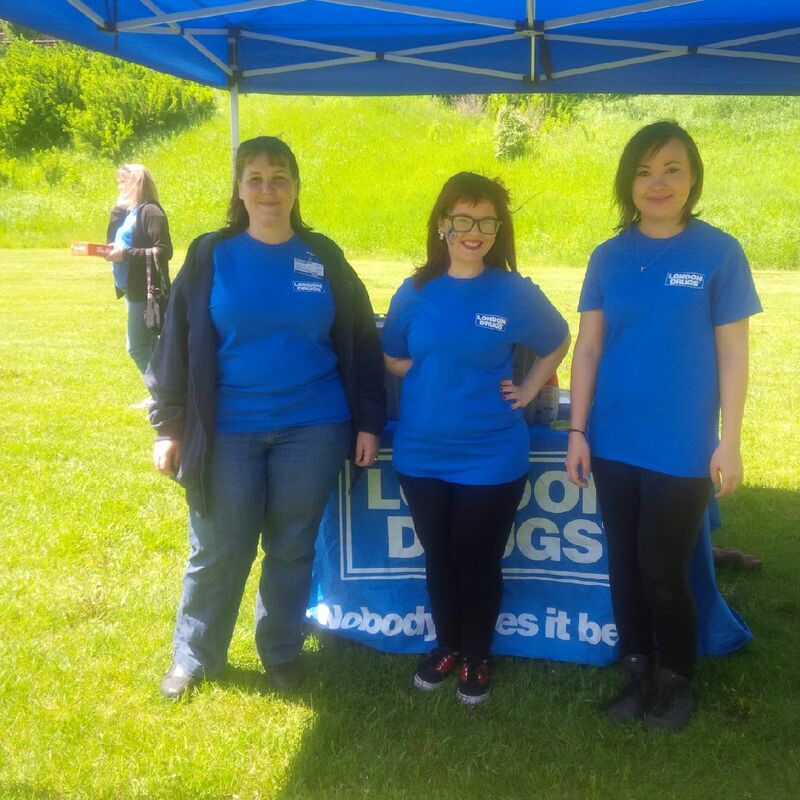 I had a lot of fun at the event which included music, food and various sales. I took full advantage of Twitter and tweeted out pictures, along with the best of them, inviting people to come down and check out the block party. I’m a huge fan of supporting local business and think this event was a great idea. 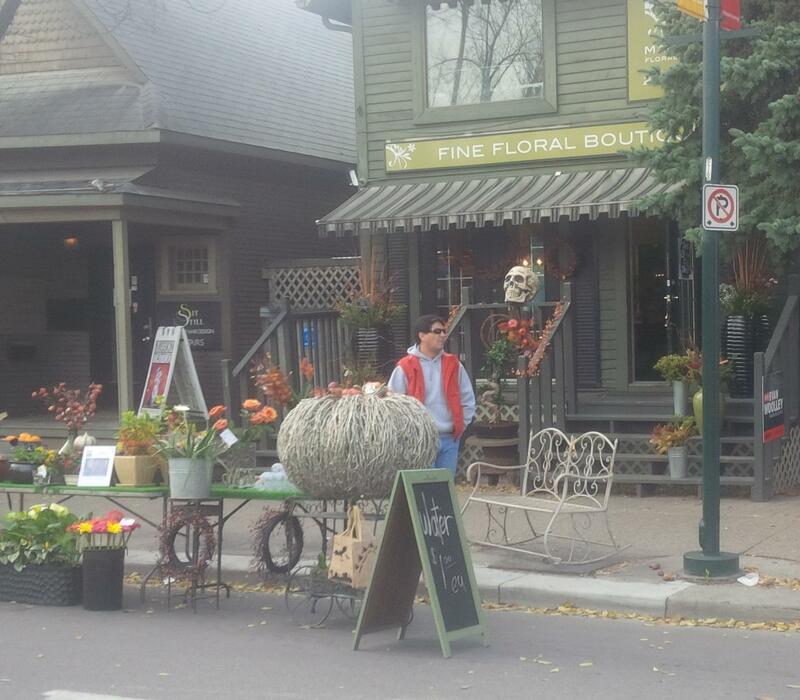 Please – if you’re a Calgarian, come back into the areas that were affected by the flood and support your local businesses. 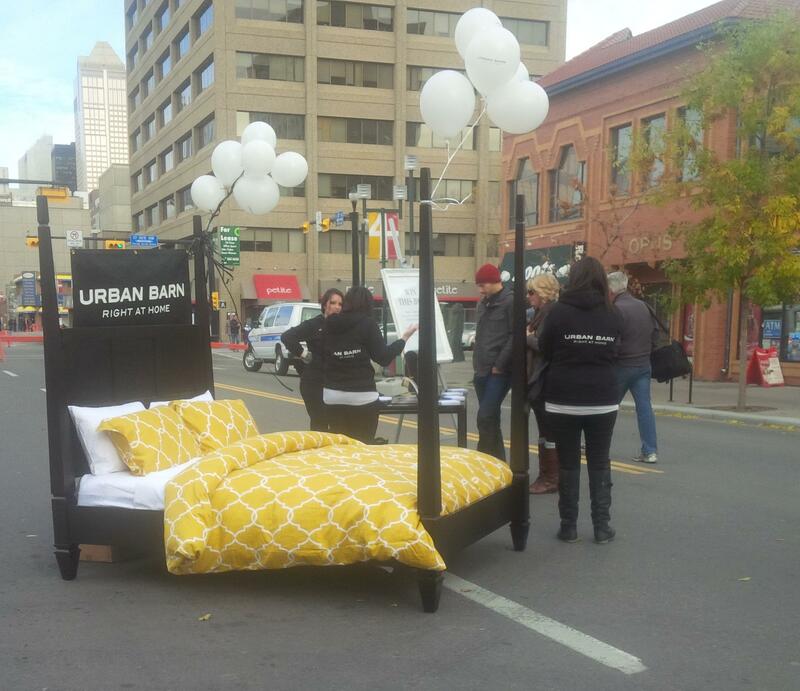 The Urban Barn had a bed on display in the middle of the street! I was thinking what a great idea in case I become tired of walking! There were several bands to enjoy, I only took a picture of these guys and (yikes) I cut the one’s head right off! I was pleased to run into the president of the BRZ (far right) John Mar (middle), my ward’s Alderman… well he had been for two terms…he was not voted back in on our election 2 days ago. Thank you for your service to ward 8 John. You were always a wonderful support for housing for the homeless and I learned a lot in my time working with you to build a good neighbour agreement and engage our community. 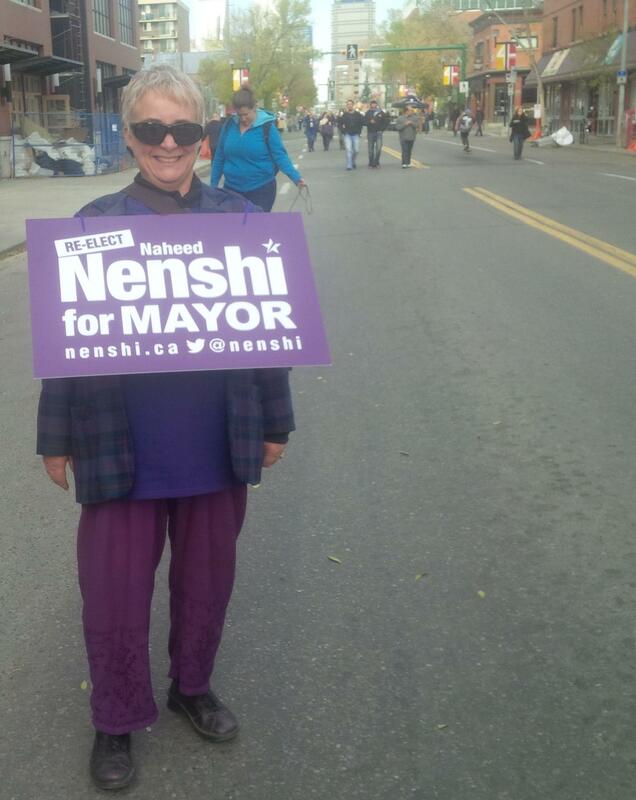 Featured below, a volunteer reminding us to vote and strongly suggesting we vote for Mayor Nenshi again! Which I did and judging by the results, many others did as well. 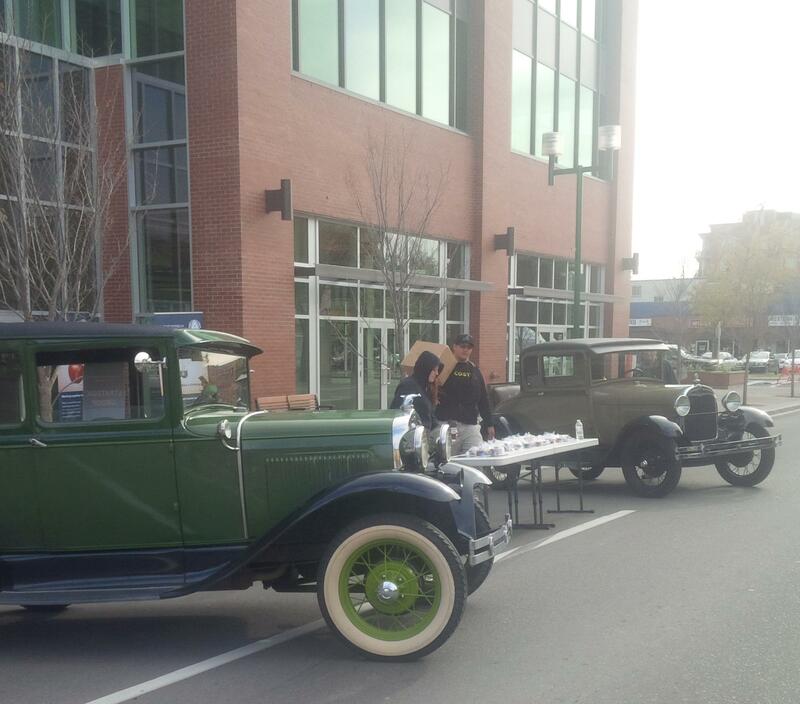 I also saw these awesome vintage cars and various businesses displaying their wares. Overall, I think Calgary is responding well to the needs that presented themselves in the aftermath of the flood. It is my hope that we continue to rally together to make our city better than it was before. 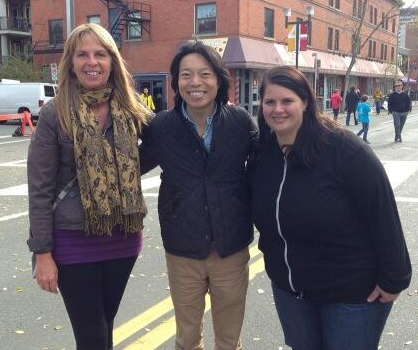 Supporting local businesses is one of the ways we can contribute. Y A H O O! Stampede 101 went off seemingly without a hitch, although I’ve heard it said that it’s sort of like when your in-laws visit – we kind of had to sweep some stuff under the rug and hope they don’t look too closely. But from my vantage point the Calgary Stampede and Exhibition 2013 was a great success in spite of recent floods! Not only did the show go on, but the Stampede raised over $2,000,000 through the sale of ‘Come Hell or High Water’ T-shirts in support of flood relief! 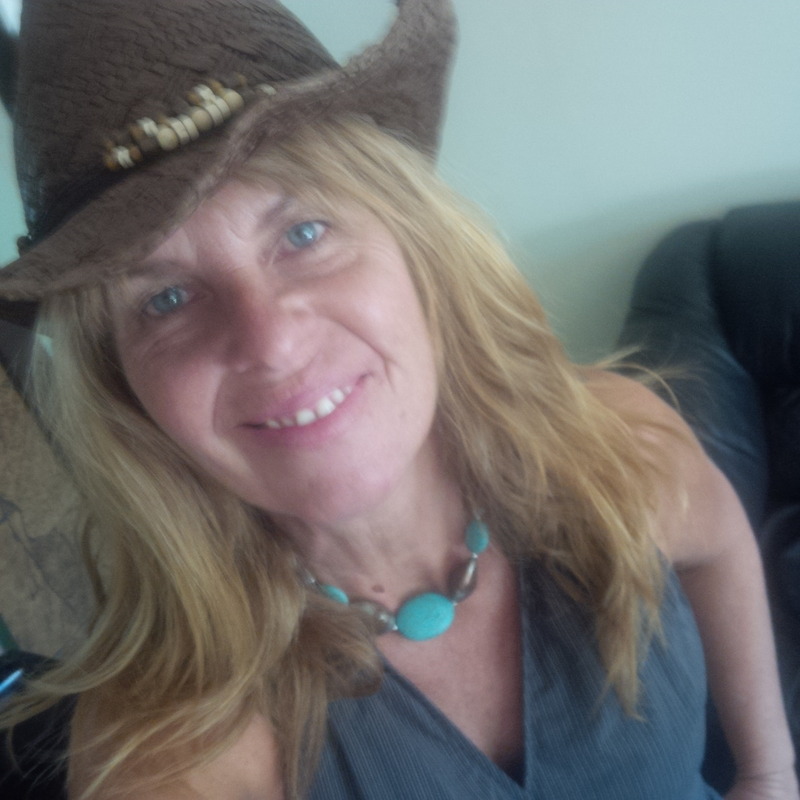 My BFF and I checked out the Stampede grounds on Thursday (Sneak A Peek night). Admission was half price so a mere $8 got us in. Sure the Saddledome was closed (with water levels still sitting at about the 8th row of seats) and the lower level of the Big Four was closed, but other than that, it was business as usual. Then we checked out the midway where you can get anything you can imagine deep-fried including butter! I didn’t try it but was super curious about how one would go about doing this, so this roving reporter (that be me) had to check it out knowing you would want to know as well. Deep-fried butter is made by coating frozen cubed butter with batter and deep-frying it. Mmmmm 🙂 not for this cowgirl! The midway also housed all the rides. As a chicken (I’m not ashamed to say so) I watched as others rode the incredibly frightful rides. When it came time to eat, my BFF opted for deep-fried Mac -n- Cheese from one of the food trucks and I went for Poutine the food of my province of birth. Always the question-asker – I really can’t help it, I swear – I managed to (unintentionally) piss off a few of the folks doing demonstrations of their products. On Friday, the official start of Stampede 101, the Stampede parade took its usual route starting on 6th Ave. and finishing on 9th Ave. I think there were over 700 horses in the parade and lots of floats. But here’s the exciting thing. Guess who was this year’s Parade Marshall?? 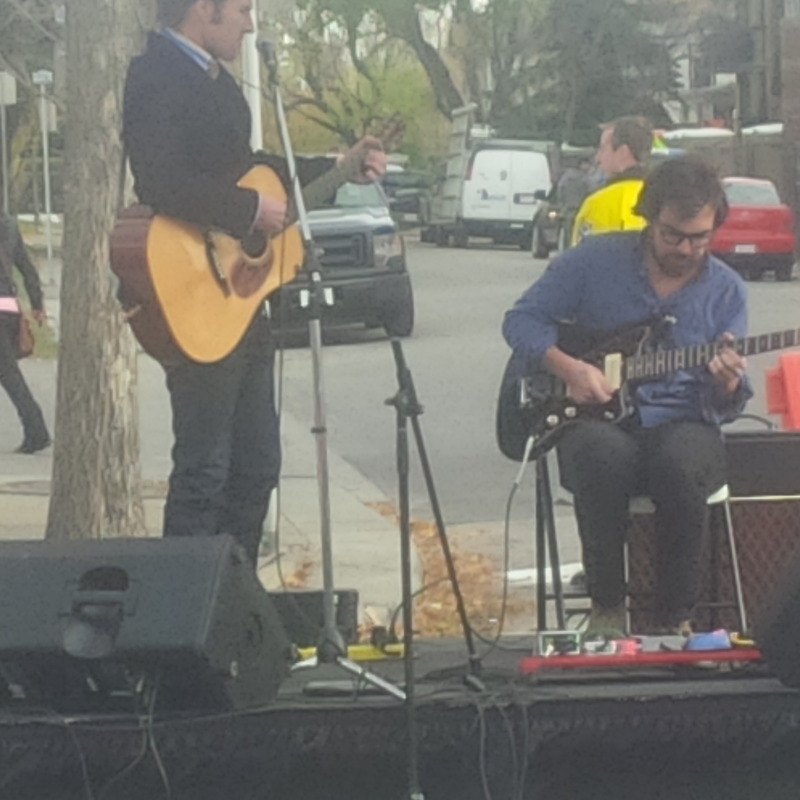 It was Col. Chris Hadfield!! The super cool Canadian Space Commander who tweeted from space!?!! I gotta tell ya, between this and the brilliant organization of flood relief from the Mayor’s office and the selflessness of volunteers trudging through mud and water to help out, I was just brimming over with that ‘Wild west Calgarian pioneer, Alberta Strong, Canadian spirit that says two World Wars and the Great Depression never caused us to cancel a Stampede so why should we let this flood do that’ pride! Can’t you just see me with my hand on my chest, (IN A PATRIOTIC WAY!!!) standing tall and proud? Well there you have it – those are the two official events I took part in. The Stampede runs for 10 days in July every year and has been doing so since the first one in 1912. This year over a million people came through the turnstiles. If you think of the Stampede grounds as a city, that would make it the 3rd largest city in Alberta. One of my absolute favourite things about these 10 glorious days is how freakin’ good looking everybody becomes in cowboy gear. I’m thinking we outta seriously consider dressing this way every day of the year! Well the Stampede ended on Sunday. Calgary is a bit quieter now. I have to admit I’m a bit sad about that. Many are back to wearing their fruit of the looms high up and their pants down low with the crotch somewhere around knee level. Alas, life is back to normal. There is still a lot of work to be done to pick ourselves up after the flood. The true cost of all the damage may not be understood for years to come but I have no doubt our western pioneer spirit will triumph and together, just as in the days of old, we will come out stronger than before! If you haven’t seen it yet, check out Col. Chris Hadfield’s version [performed in space] of Space Oddity below. What’s your favourite event in your city? The Southern Alberta Flood has left its mark. Tens of thousands have been directly affected. A larger number have responded. Will we remember the devastation? I’m sure this story will be told for a long time. Thousands of volunteers have helped without wanting anything in return. Thousands have reached out saying if the tables were turned they know the same compassion would be extended to them. From rolling up their sleeves and getting dirty shoulder-to-shoulder with those affected, delivering meals to volunteers and raising funds through lemonade stands – people have given of themselves. Every time I hear a story of gratitude I am moved to tears. In the face of losing so much, love and human kindness have prevailed. Yes, the story of the Alberta flood will be told for a long time in these parts. But what really stands out to me is the giving. I know I’ve been witness to this in action over the last 10 days. Covered in mud and feeling good! I’ve never seen it so green. My community was not affected by the flood. 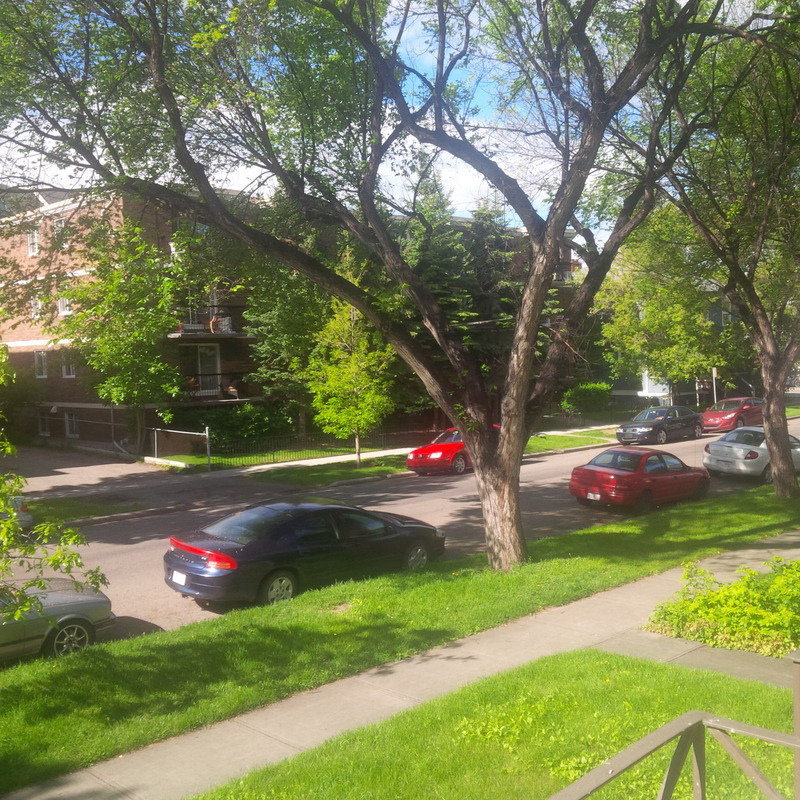 If you were here looking out my window, you would see green luscious grass and trees heavy with leaves – so much more greenery than I’ve ever seen in our typically dry climate. 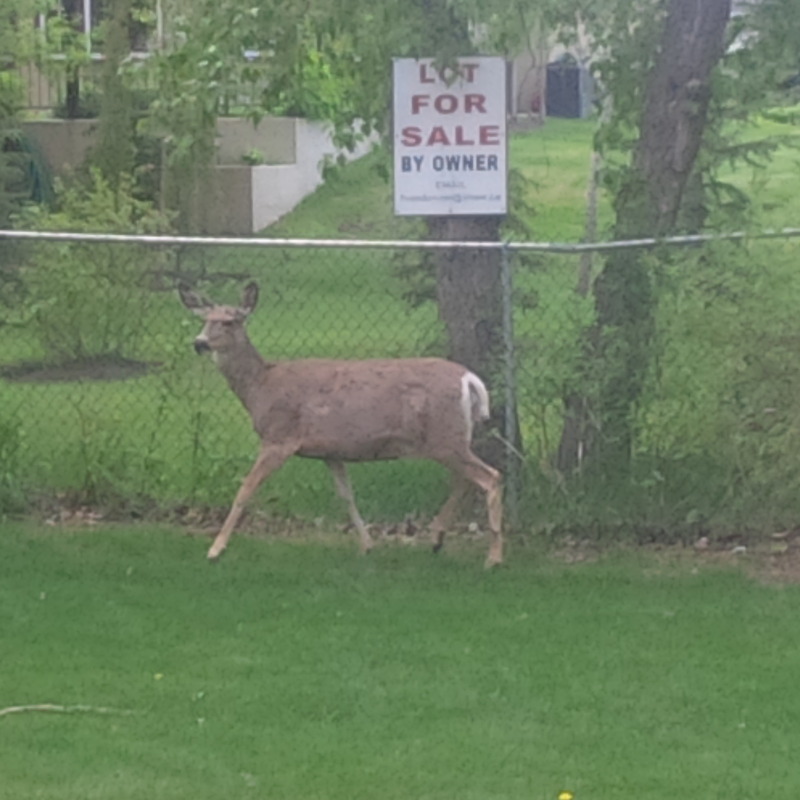 You would see the guy across the street mowing the lawn. If you were here and didn’t turn on the TV or check social media, you wouldn’t have a clue that anything happened at all. It’s sunny. It’s warm and summery. You would never guess that just blocks away, homes have no power. Entire basements and parking garages were flooded and family treasures have been destroyed. As in tune as I’ve been on social media and images on the news, I’m always too late to help. A call for volunteers goes out and a group of hundreds, if not more answer the call to the point of volunteers having to be turned away. I have offered my place. I have offered food. I have offered a shower. But always someone has offered a moment sooner. A woman I know chose to hunker down with her cat in spite of the fact that she has no power, yet the waters did not affect her – her place is dry. Her office in Calgary’s Kensington district was ravaged by waters, and tenants in that building met the same fate. She took in one of the tenants who has lost everything except for the clothes on her back. Most people have been allowed back to their homes to assess the damage. So my friend and I set out on foot to see where we could help. It was time to stop waiting to jump upon an organized effort and just do something. There were many who already had friends and family helping. We were, however, able to help a few. I never knew how crumbly drywall becomes when it’s wet, how easily it falls apart. We loaded the remnants of basement walls into a dumpster. On the lawn outside, the homeowner laid family photos out on a blanket to dry. An English teacher across the street was helped by some homeless guys and she paid them for their efforts. (How kind of her) We volunteered our help and she assigned us to the dark basement with a small flashlight and a metal bucket to clear out the storage under the stairs. A couple of inches of water remained and she gave us each a pair of Crocs to wear for our work. A wool blanket, a comforter, shoes, Christmas decorations, purses and other such items, mostly destroyed and dragged to the curb for the City of Calgary workers to pick up. When we left she gave us this cart-like thing on wheels, saying it might be useful to us to haul stuff out for the next house we came upon. We came upon a man who wanted to push his friend’s car out of the way. It was a standard and I felt like a real he-woman/hero for being the only one there who knew how to put it in neutral! The streets and curbs were filled with damaged treasures wherever we went. Many people were sifting through piles of items to separate the salvageable from the now-garbage. I wanted to take pictures to document this day, but somehow I couldn’t bring myself to it. It just felt too intrusive to do so. At the end of the day we were covered in mud and feeling pretty darn good that we were able to help some neighbours clean up. People all over the city are responding. Just in my neighbourhood, The Ship and Anchor and its neighbour The National both hosted barbecues for evacuees. My neighbour hosted a concert to raise funds for flood victims. 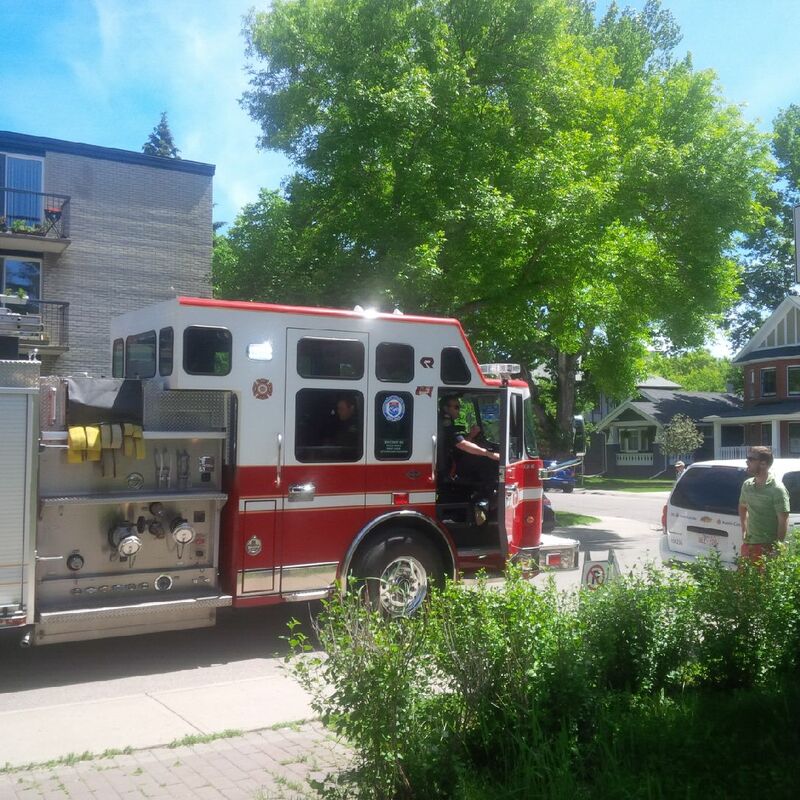 Sled Island was canceled but it’s rumoured that some showed up at my neighbour’s place to play! And two young ladies set up an Italian Soda stand. All their proceeds going to support victims of the floods. Although I have no photos of the clean up, I do have some you may be interested in below. These young ladies sold Italian sodas for $1 to support displaced victims. Even Mayor Naheed Nenshi said he “wants his new boots” for the Stampede… “It may look different but the show will go on” he told CTV News. Calgary’s Mayor has been a rock during this devastating flood. He has done an incredible job of keeping Calgarians updated on communities that are being evacuated, ways that we can help – and has made full use of social media to do so. The Calgary Stampede and Exhibition (The Greatest Outdoor Rodeo on Earth) is scheduled for July 5 – 14 and Calgarians are determined for the show to go on! I have no doubt in my mind that it will! Efforts to support the victims of the worst flood Calgary has seen since 1932 continue to tirelessly go on. I am so inspired by those who are helping. 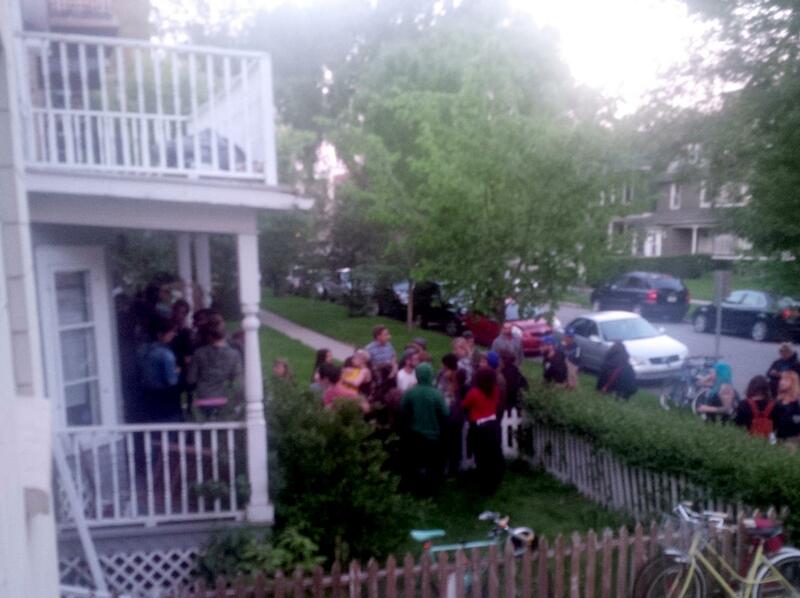 As I type, a group of people are gathering next door to attend a concert organized by the coolest neighbour ever! This concert will raise funds to provide relief for flood victims. I am teary-eyed today. I think the shock and disbelief has worn off. I have been blown away by those coming in from the outside to help. Oh how my faith in humanity is affirmed and well-placed by the response from others to this devastating flood that is devouring Southern Alberta. Below some unconfirmed stats. 2500 troops have been deployed to many areas to do whatever is needed to help communities affected by the flooding. 100 Edmonton police have come here to help. dozens of leisure centres and Legions have opened their doors to provide shelter and food to displaced citizens. The City of Calgary’s Mayor, Aldermen, first responders, health providers, social agencies are working long hours alongside hundreds, if not thousands of volunteers. Visits and assurances of financial assistance when we start to rebuild have come from our Premier and Prime Minister. I am so proud of you Calgary! A city that was built on the backs of ranchers and entrepreneurs. A city that does not lay down in defeat. A city that boldly claims that its internationally attended Calgary Stampede (due to take place in a few weeks) will not be postponed even though the Stampede grounds are under water and the Saddledome is flooded to the 10th row of seats! If anyone can pull it off, Calgary – you can! My thoughts and prayers continue to be with those who have lost so much. Below are some pictures that were floating around on my facebook homepage and come from an album that was shared by AMP Radio.